Latin Flavored 'Fun In Acapulco' Scores! A Mexican locale, some Tijuana horns, plus the interesting presence of the Mexican ‘Amigos’ at the recording sessions presented a novel setting for Elvis. After the formulaic ‘World’s Fair’ soundtrack here was a far more stimulating challenge for him. The Tijuana sound of Herb Alpert was prominent on radio stations at the time and some of Elvis’ favourite songwriters (ie Don Robertson) provided some excellent soundtrack material. FTD have now issued 6 extended movie soundtracks on CD. Each one is released with an improved re-master of the original LP plus alternate takes and a colour booklet full of photos and information. It seems an odd marketing policy to release these CDs in groups of three since not everybody can afford the luxury of buying all 3 at once. Plus many of us would have previously purchased them already in RCA’s "Double-Feature" series. A Mexican locale, some Tijuana horns, plus the interesting presence of the Mexican ‘Amigos’ at the recording sessions presented a novel setting for Elvis. After the formulaic ‘World’s Fair’ soundtrack here was a far more stimulating challenge for him. The Tijuana sound of Herb Alpert was prominent on radio stations at the time and some of Elvis’ favourite songwriters (ie Don Robertson) provided some excellent soundtrack material. The single ‘Bossa Nova Baby’ got to #8 in the charts while the soundtrack LP made # 3. All these CDs are presented in a beautifully printed deluxe gatefold sleeve looking very much like the original LP. 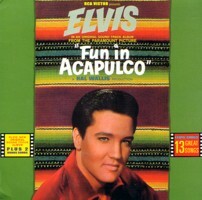 Fun In Acapulco is one of Elvis’ soundtracks that deserved an extended outing and at 70 minutes, including the alternate versions, the CD runs almost as long as the movie itself (97 mins)! The packaging, in a ‘45 rpm’ size concept, is delightful and fits perfectly next to my Elvis 45rpm box sets. The pictures which include some rare movie stills and Cinema lobby cards are excellent. Can you believe that there was a lobby card for an Elvis movie that did not feature Elvis himself? (Ursula Andress is alone in one) How did the Colonel let that publicity get through? The use of the original LP label for the CD holder is also cute. Although I was a little disappointed in the colour tints on 2 of the pictures (and there is also an error with the take numbers in the booklet) the photos overall, plus the brilliant one of Elvis and Ursula Andress getting very close, more than make up for it. While everyone should be familiar with the original LP, the updated audio re-mastering is excellent and makes the sound so much brighter than the 90’s ‘Double Features’ version. The original LP is presented first and, as the old RCA logo indicates, in gorgeous ‘Living Stereo’. The audio mix on all the tracks has been spatially opened up to create a really tremendous wide stereo mix. (The original stereo LP almost sounds mono in comparison!). This allows all the musicians to shine as well as giving The Jordanaires & back up vocals a better role since they are now separated further from Elvis’ vocal track. Elvis’ vocal itself is perfectly placed and the whole sound has the real punch & clarity of the original 45rpm vinyl singles. As some of the movie tracks have no alternate versions it is a treat to get them in this new quality at last. On all the tracks the percussion and horns, which were such an important part of the soundtrack, really sparkle and some parts that were somewhat hidden before (ie Dudley Brook’s great piano part on ‘Bossa Nova Baby’) are now deliciously clear. It is a great listening experience compared to the slightly muffled sound of the Double-Features series and some odd errors from that series have also been fixed up. Digging deeper . . .
‘Fun In Acapulco’ was a track recorded in just one take and from the very first scrape of percussion to Tiny Timbrell’s mandolin it sounds exquisite. For some reason the Double Features version included an odd fade-out at the end which has been corrected here. The original LP ‘Bonus Tracks’ have also been included. ‘Love Me Tonight’ has a fantastic new clarity which make the guitars really sparkle & ‘Slowly But Surely’ is the best version we have had so far. The old muffled sound has been removed (sounds like they have got hold of a new generation master tape) and with the new clear drums and backing vocals the track has a much improved, funkier, feel. The extra outtakes are also a great addition and 17 new takes are included here that have never been released before. ‘Mexico’ is represented by 4 outtakes, all excellent versions. I have never understood why they released the incomplete lyric version on the LP, since the complete lyrics work so much better. Tk 7, previously from ‘Out In Hollywood’, is in better quality here (listen for Elvis’ off-mic growl @ 1.25). Previously unreleased Tk’s 1 & 6 delight as Elvis fluffs the lyrics. Dudley Brooks’ piano is higher in the mix too making it a slightly different sound. ‘The Bullfighter Was A Lady’ - Elvis decided to remake this song and the second version recorded the next day, already featured on ‘Silver Screen Stereo’, definitely has more balls. It is extraordinary that RCA decided to release the initial version on the original LP. The unreleased earlier takes feature the fun of Elvis interacting with the Amigos who you can hear speaking Spanish in the background. Elvis is obviously having real fun with this soundtrack and his enthusiasm shows through his great vocals. On an early take, Elvis gets thrown by the Amigos shouting "O-Lay." Elvis laughs "I can’t hear it because of the ol’ lay. Someone get that Ol’ lay out of the way, I can’t make it! I had her years ago." Spontaneous and great fun. ‘I Think I’m gonna’ Like It Here’ – The remake is at a faster tempo and far more preferable than the original laid-back version that started side 2 of the LP. You can clearly hear Elvis clicking his fingers, a sure sign that he is enjoying the vibe. Tk 1 is a delight since it is always fascinating to hear the early rougher takes. Elvis hasn’t absorbed the lyrics yet so listen out for him singing a delightful, "I Don’t know it" @ 1.58! ‘Bossa Nova Baby’ – Take 1 is a delicious false start with Elvis saying, "Hold it Hold it. Is there something wrong with the intro?" Take 2 is a classic with a very different feel to the single. It is already available on the ‘Platinum’ box-set but again it sounds much better here. Listen to Dudley Brooks’ delicious jazzy piano on this version. Unreleased Take 3 has the similar jazzy vibe. ‘Marguerita’ Tk 6 – A Don Robertson song with a fabulous Latino feel. Similar to the LP version but this one has less Spanish guitars in the mix. ‘You Can’t Say No In Acapulco’ Tks 1-4 – Elvis has trouble with the count in. At one point he gets very frustrated making them stop the tape saying, "Hold It, Goddamn it!" As always it is fascinating to hear the recording process in action. On the first complete version (Tk4) Elvis seems a little reticent with the lyrics and the tempo is a little slower. ‘Guadalajara’ – Elvis’ version of this great Mexican tune (a song still heard all over Mexico today) was recorded as a vocal overdub. This causes Elvis much amusement when, on Take 3, they start the backing track at twice the correct speed. Elvis delightfully laughs "It’ll never happen, never happen" before they correct the speed. Verdict - If you liked the movie, or like Elvis’ Latino songs, I would strongly recommend Fun In Acapulco as a great introduction to this FTD Soundtrack series, it is one of their very best. Then, if you like the new packaging and fabulous sound, save up your money and buy your next favourite!